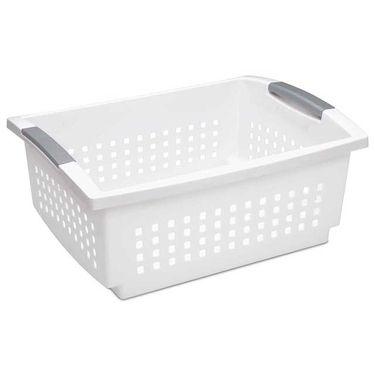 The Sterilite large stacking basket is one of our most popular stacking baskets. Featuring grey flip-in handles and a sturdy white plastic body, this plastic storage basket delivers wiggle-proof stacking capability. Of all the storage bins and baskets, this one is perfectly sized to hold lots of toys, shoes, linens, scrapbooks, clothes, or other bulky items. Thanks to the solid construction, toting heavy items is not a problem. As the largest stacking basket in the series, the storage possibilities are endless.